In 25 words or less: Felix discovers a thorn in his side but pitches well otherwise. The Mariners fall short after finally getting to a Yankee castoff. This one featured Orlando Hernandez going up against Felix Hernandez. For some people out there, it also signifies the first time in five days they've seen Mariner baseball. For probably the same group, it'll be the only Mariner baseball they'll see for another five days. Frankly, I can't blame those people. Solid start. Timo Perez chopped a full-count pitch up the middle, where Betancourt ran a long way over and had the ball go off the end of his glove, though a play on the ball might have been a lot to ask. Tadahito Iguchi rolled the first pitch to second, advancing Perez to second. Carl Everett watched as Felix threw over to third to pick off Perez by ten feet. Evertt ended up taking a 1-2 death curve for strike three. El Dookie. Ichiro, coming off a 5-for-29 road trip, grounded a 1-2 pitch hard to short. Willie Bloomquist whiffed on a high 0-2 fastball. Raul Ibañez fell behind 0-2 and rolled a 1-2 pitch to third. A baserunner. Paul Konerko bounced the first pitch to third. AJ Pierzynski got ahead 3-0 and ended up lining out right to Bloomquist at second. Jermaine Dye clubbed a 2-2 pitch into the gap in leftcenter for a double and the first extra-base hit for anyone off of Felix Hernandez. Geoff Blum grounded the 2-2 pitch to the mound. A bit dashed. Richie Sexson lofted a second-pitch single into leftcenter. Adrian Beltre checkwhiffed at an 0-2 slider low and away. Greg Dobbs popped a 3-1 pitch to Konerko in the first-base coaches' box. Yuniesky Betancourt popped the second pitch to centerfield. Another first. Juan Uribe grounded the first pitch off Felix's hand and up the middle to Yuniesky Betancourt, who barehanded the ball behind the bag at second and threw in time to first (1-6-3 putout). The trainers came out and looked at the hand of Felix after he threw a couple of warmup tosses. Brian Anderson clubbed the first pitch into the back of the visitors bullpen, hitting the stairway, which is covered by net now, unlike in 2000, when you could grab a homerun ball from the stairway. It got out in a hurry for the first gopher ball given up by Felix. Perez was caught looking on a 2-2 pitch. Iguchi bounced the second pitch to a charging Beltre. Jeremy Reed fell behind 0-2 and five pitches later splintered his bat on a 1-2 tapper back to the mound. Yorvit Torrealba took a 2-2 pitch in the shoulder and took his base. Ichiro laced a 2-0 pitch to rightfield for a single, and Torrealba moved to third, though partly thanks to an offline throw from Dye in rightfield that may have been in time if more accurate. Bloomquist had the squeeze play on, and Bloomquist bunted the second pitch to the right side, where Orlando nicely made a backhand flip to get Bloomquist, but it worked since Torrealba scored and Ichiro moved to second. Ibañez got ahead 2-0 and later grounded out hard to Konerko behind the bag, who ran to step on it. Again, minimal damage. Everett fouled an 0-2 curve into Torrealba's glove behind the plate. Konerko ripped a 2-2 pitch past Beltre and through the hole on the left side for a single. Pierzynski fell behind 0-2 and eventually whiffed on a 1-2 curve on the seventh pitch. Dye got ahead 2-0 and popped a 2-2 pitch to Sexson in foul ground on the right side. Not taking advantage. Sexson popped the first pitch high to shallow centerfield where it landed between the middle infielders and Anderson coming in from centerfield, saving an out from Sexson, who ended up on first. Beltre rolled over on a 2-2 pitch for a 6-4-3 double play. Dobbs flew out to leftfield on a 2-2 pitch. Might he be cruising? Blum took an 0-2 death curve over the outside corner. Uribe rolled out to short, with Sexson tagging him after Betancourt's wide throw. Anderson took a 1-2 fastball over the outside corner. Betancourt whiffed on an 0-2 breaking ball. Reed got ahead 2-0 and later bounced out to second. Torrealba cranked the second pitch over the centerfield fence in front of the hitters' backdrop (418 feet) for some sweet revenge and his first Mariner home run. Ichiro fell behind 0-2 and wound up lightly chopping a 2-2 pitch to the right side, where Orlando came off the mound and threw to first. Impressive damage control. Perez chopped a 1-2 curve along the first-base line to Felix, who ran to the bag for the out. Iguchi punched a single through the left side. Everett laced the first ptich into shallow centerfield for a single, moving Iguchi to second. Konerko whiffed on an 0-2 death curve low and away. Pierzynski took a 2-2 knee-high fastball over the outside corner. It's not easy in this game. Bloomquist flew out high to Iguchi on the outfield grass. Ibañez pushed the first pitch past Konerko and into rightfield for a single. Ibañez took off on the 0-2 pitch to Sexson and was out by about five feet. Sexson took a 2-2 fastball over the outer half. Ouch. Dye flew out on the first pitch to Reed in leftcenter. Blum bounced to the first-base side of the mound, where Felix took care of it. Uribe worked a 1-2 count full before taking a full-count pitch high. Anderson fell behind 0-2 before cranking the 1-2 pitch into the Mariner bullpen. He's not fazed. Perez fell behind 0-2 before bouncing out to second. The wind had already fled the sails. Beltre grounded the second pitch hard to third. Dobbs rolled a second-pitch groundout to third. Betancourt popped high to Konerko in foul ground on the right side. JJ Putz came in for Felix. Iguchi popped a 2-2 pitch high to rightfield. Everett grounded a 2-2 pitch hard to third. Konerko flew out to Ibañez reaching back on the leftfield track. Off the hook. Reed flew out high to Blum near the mound. Torrealba scooped a single into centerfield. Ichiro got behind 0-2 before popping the 2-2 pitch to Blum near the seats on the left side. Bloomquist cranked the second pitch into the leftcenter gap, scoring Torrealba from first. Ibañez popped the second pitch high to Konerko near the tarp in foul ground along the rightfield line. George Sherrill came in for Putz, though the inning was delayed by Ozzie Guillen asking for Sherrill to tuck the strings into his glove. Pierzynski grounded out to Sexson behind the first-base bag on the first pitch. Julio Mateo came in for Sherrill. Dye got ahead 2-0 and wound up shooting a 2-2 double behind the bag at third past Beltre and to the corner for a double. Blum popped to Beltre in foul ground near the seats. Uribe whiffed on a 2-2 pitch. Cliff Politte came in for Orlando. Sexson popped off the end of the bat to leftfield. Beltre took a 3-1 pitch inside. Dobbs fell behind 0-2 and whiffed on a 1-2 offspeed pitch. Betancourt looped a 1-2 flyout near the rightfield corner. Clutch damage control. Anderson golfed (one-handed) a 1-2 pitch off the track in centerfield for a double. Perez bunted the first pitch along the third-base line to Mateo, who threw in time to first as Anderson moved to third. Iguchi nearly doubled a 2-2 pitch into the leftfield corner for a double, but later whiffed on a pitch over the outer half. Everett whiffed on a 1-2 fastball high and tight. Yuck. Reed grounded the first pitch to Konerko behind the bag at first. Torrealba popped the second pitch high to Anderson in shallow centerfield, a different result than Sexson's 'tweener earlier in the game. Ichiro whiffed on a 3-0 pitch before popping the next pitch to Blum in foul territory near the bag at third. Hanging tough. Konerko fell behind 0-2 before softly lining out to rightfield. Pierzynski lasered a 2-2 pitch past the mound and up the middle, where Bloomquist tried to make the play, but it would have been very late, and luckily he didn't airmail Sexson at first this time. Dye fell behind 0-2 and apparently held a 1-2 checkswing (close) on a ball barely off the outside corner. Dye ended up whiffing on a 2-2 pitch low and off the plate outside. Blum lined the second pitch right to Ichiro. Luis Vizcaino came in for Politte. Bloomquist popped the first pitch into foul ground on the right side, where Konerko was blocked by first-base umpire Bob Davidson. Bloomquist later whiffed on a 1-2 pitch low and away. Ibañez popped the second pitch (down and in) to Pierzynski behind the plate. Sexson took an objectionable inside 1-0 pitch for a strike and later popped high to short. Jeff Nelson came in for Mateo. Uribe bunted the second pitch along the first-base line, where Nelson came off the mound and tried to throw as he was falling down and threw it past Sexson and down the rightfield line. Uribe had rounded first, and luckily Bloomquist backed up the play and made Uribe dive and swim back to first. Anderson bunted in front of the plate, where Sexson picked it up and threw in time to first. Eddie Guardado came in for Nelson. Aaron Rowand, hitting for Perez, took a full-count pitch down and in...but for a strike. Iguchi crushed one into the visitors' bullpen, hitting the stairs. Everett lined a 1-2 double into the rightfield corner. Konerko was intentionally walked. Guardado went to his mouth while on the mound and was charged for a first ball to Pierzynski, who later nearly doubled down the rightfield line. Pierzynski finally rolled to short for a 6-4 fielder's choice on the eighth thrown pitch of the at-bat. Dustin Hermanson came in for Vizcaino. Beltre flew out high to Dye in shallow rightfield. Dobbs flew out to Anderson in the leftcenter gap just short of the track. Dave Hansen, hitting for Betancourt, lined a full-count pitch into centerfield, where Rowand ranged over and made a running catch. Though in Texas he threw a perfect inning against the Rangers, it was against the bottom of their lineup, so the competition wasn't top-notch by any stretch of the imagination. Fast-forward to this particular game, and he had to face the second, third, and fourth hitters in the Chicago lineup with the Mariners down one run in the eighth. In other words, he had to face better hitters on a better team with the situation still being sticky. Of course, it does help to pitch in a pitchers' park instead. Anyway, Putz mowed through Tadahito Iguchi, Carl Everett, and Paul Konerko. He didn't get into any really unfavorable counts, though his final two outs were hit pretty hard and I thought Konerko's fly ball was going to sail into the bullpen. Still, Putz entered the inning with a one-run deficit, and he left the inning with only the one-run deficit. It's progress. With a little over a month left in the season, we'll probably end up seeing some mild regress as well, but this could be something for Putz to build on, you never know. Since this guy may or may not be the closer next year, he needs all the progress he can get. Doughnut-for-five. He came to the plate in the second, fourth, seventh, ninth, and twelfth, and all of his at-bats ended with outs. Two of those outs got out of the infield, and both of them were flyouts to left. One of the outs was a whiffer. Those aren't so bad except that the two remaining outs were high flies into foul territory. I guess it just ticks me off that the name for it is "designated hitter" and all the Mariners got was a designated out-maker hitting in Felix's spot. He could have gone 0-for-5 just as easily, though I'm sure all Mariner fans don't want to see Felix have to hit, if only for fear of injury or sprinting out of the box and pulling a groin or whatever. If you were looking for a whole new reason to hate interleague play since Edgar's gone and you don't have to find a way to shoehorn him into the lineup, you have your new reason. I'm going to cringe every time I see Felix step into the batter's box. Anyway, in two of those situations I mentioned earlier, Dobbs came up to the plate with a runner on first and one out. He got ahead 3-0 in the second and popped the 3-1 pitch foul, which is unclutch. In the ninth, he fell behind 0-2 and went down swinging. Designated out. Felix first. I don't know if it was just me, but it seemed like the White Sox were more adept than past opponents when it came to fouling off pitches with two strikes, namely the curveball, of which some of the hitters were able to get a piece if they couldn't get it all. The only guy that really got it all was Brian Anderson, who made it happen twice. If all is fair and right in the world, Anderson never does that against Felix ever again and goes hitless in his next 26 at-bats against him. As for the rest of the White Sox, their success was spotty at best against Felix. When all three of the runs scored against him come home on Anderson's homers, that should tell you something about how the rest of the lineup did. Felix did strike Anderson out once, but it definitely wasn't enough to make up for two homers. Though Felix did great once again, the Anderson homer in the bottom of the seventh just took the wind clear out of the sails, and I enjoyed my DiGiorno pizza significantly less as a result. The enjoyment factor decreased exponentially when the game went to extra innings. For all the guff that I'd given him, Willie Bloomquist shut me up after this game for two reasons, though I won't forget the final game of that Minnesota series for a while. That triple in the eighth bailed Felix out of a loss and also snapped Bloomquist's 0-for-20 slump. In the third inning, he also put down the squeeze bunt to score Yorvit Torrealba and tie the game at a run apiece. The 1-for-4 day bumped his August average slightly up, now at .245. I think that barring a mother of a slump, we're probably relegated to seeing Bloomquist start for the rest of the year. Based on September callups, he might not play second base the entire time, but I'm sure Hargrove will bench Jeremy Reed a couple times and keep Bloomquist in the lineup, not that I'd want it that way. On the other hand, and much to my chagrin, Reed isn't giving Hargrove too much incentive to keep him in the lineup other than for his stellar defense in centerfield. I wonder how much better the Mariners would be right now with a healthy Jeremy Reed hitting .278 in the second slot in the lineup. Instead, what we're seeing is a .252 hitter that's been bumped all the way down to eighth. That's cold, but...he's not doing much. By the way, Reed's hitting .241 this month, and he's hit over .241 in only one month this season, and that was May (.312). I think Ichiro's suffering from a bit of homer hangover and some grounding balls right to fielders and not finding any holes. In this one, he had the one hit, a hard grounder, a tap to the mound, and two pop fouls (unclutch, those flyouts). Ichiro's hitless games by month and corresponding batting averages in parentheses: four (.356), five (.288), eight (.243), four (.364), seven (.245, in progress). We've heard about Ichiro's wild fluctuations from month to month, and I'm hoping he tears through September, or I'll be a bit angry. Hey, he's only making about $12.5M this year, so no big whoop. After last season and the crazy hit romp, what could have been anyone's realistic expectation of Ichiro? I think I'd have to say about .320. I definitely wouldn't expect .299. I'm glad the Mariners aren't fighting for a playoff spot right now, because I'd be looking at someone in particular down the stretch. I remember what happened in 2003. His worst hitting month of his Major League career was that August, when he hit .242 and followed it up with a .273 September (evidence). 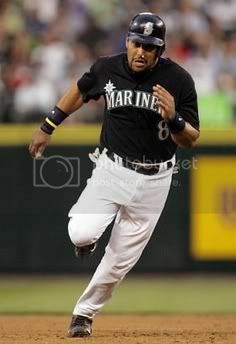 As badly as Bret Boone's career tailed off in 2004 and 2005, I will commend him right now for being one of the few Mariners that did anything down the stretch in 2003. If I'm remembering correctly (there's lots of things about that second half that I try to block out), the only other guy that was holding up okay was Randy Winn. To answer any questions, yes, the Mariners did start out the 2003 season by going 42-19, and yes, they did finish it off with a torrid 51-50 stretch. One of the worst sports experiences of my life. Multi-hit games in this one belonged to Richie Sexson and Yorvit Torrealba. Sexson singled his first time to the plate, and his other single was thanks to miscommunication by the Chicago middle infield and Brian Anderson as the high fly ball landed between all three. Anderson would later find himself in a much better situation. Torrealba, on the other hand, ended up scoring all three of the Mariners' runs in this game. He drove himself in once with his first homer as a Mariner, and Bloomquist drove him in the other two times with the squeeze bunt and the triple. In related news, Torrealba is hitting .325 in his month with the Mariners. He's been starting regularly since the 14th. If you take the totals from there, he's hitting .414 (12-for-29) the past two weeks. There's no way in hell that'll hold up, but wouldn't it be nice if a #9 hitter that's hitting .325 for the month was followed by a leadoff hitter that was hitting something at least a shred more humane than .245 for the month? What's next? No Felix until next week when the Yankees come to town and we'll see the much-anticipated Randy Johnson/Felix Hernandez matchup. Hey, at least the Mariners only have the next twelve games against the White Sox, Yankees, Angels, and Athletics. It could be worse. Hoping for .500 out of that stretch would be a minor miracle.